John Lennon commemorative stamp released . Beatles Radio: The Beatles, Solos, Covers, Birthdays, News The Fab 4 and More! 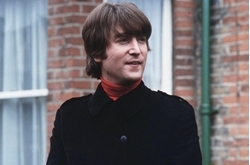 John Lennon’s iconic round glasses and shaggy 1970s mane will now adorn a U.S. stamp. Lennon’s widow, Yoko Ono, and their son, Sean Lennon, were in New York City’s Central Park Friday to celebrate the U.S. Postal Service’s release of a stamp honoring the late Beatle. Hundreds of Beatles fans gathered for the event. The commemorative stamp features a photo of Lennon taken in 1974 on the roof of his Manhattan apartment building by photographer Bob Gruen, who also spoke at the event. The stamp is designed to look like a 45-rpm record sleeve.